Have you seen the Handmayde series on the Long Thread this month? Ellen is featuring a different theme of homemade items each week in May, and kicked it off with weddings this week. 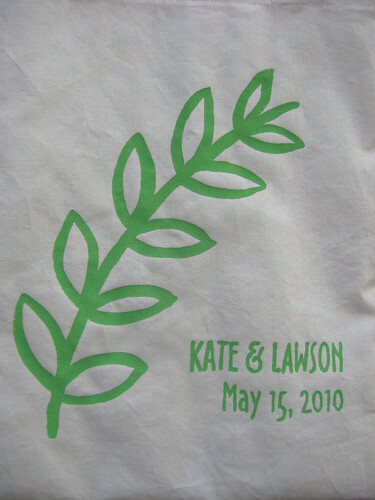 I am excited to be sharing the tutorial for the screenprinted tote bags which I made for my wedding last year. We gave the bags as welcome bags to guests staying at the hotel, with a packet of information about the wedding and some snacks and a bottle of water (and we made some extras for friends who didn't stay at the hotel, too). 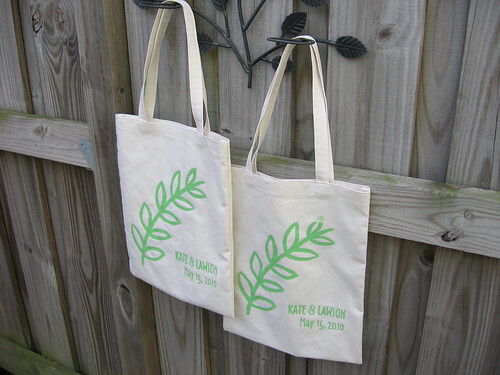 It was a great way to give our wedding a homemade feel from the moment guests arrived, and we were happy to be giving them a reusable bag rather than using something disposable. These would also make great gifts for a bridal party if you wanted to do something smaller scale. You can see some of the other DIY projects that I did for our wedding here if you are interested. I made the screen using drawing fluid as a resist to paint the design on the screen before blocking out the non-printed area with screen filler. I like how this technique lets you create a more painterly design, although you could also use it for a more precise drawing. Alternatively, you can create a screen from a design printed on a transparency using the photo emulsion technique. You can either tape the edges of the screen before you transfer the design or after - in the photos before, I taped the screen first. 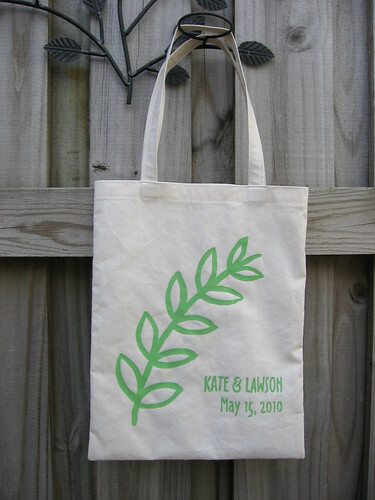 Also, you will notice that I made a different screen design below for the purposes of this tutorial, but then reprinted the original screen from my wedding to make the actual bags. Start by sketching design ideas on paper using the paintbrush and india ink. If you want to have text on the screen such as your names and the date of the wedding, play around with different fonts on your computer and print out a few options to see what looks best with your design. Arrange your chosen design and font as desired and then lay the screen on top, flat side down. Trace the design lightly onto the screen using pencil, tracing the entire outline of the letters but just the main lines of the sketched design. Note - if you are using a screen with a hinges and a base, you will want the hinges to be at the bottom of your design. Turn the screen over so that the flat side faces up and paint the design using drawing fluid, following the traced lines. Let the drawing fluid dry, which should take 3-4 hours (if there are areas that are particularly thick, they may still be sticky, which is fine). With the flat side of the screen facing up, pour the screen filler along one edge of the screen (I used too much, you will not need this much). Also, I forgot to do this but it helps if you raise the screen by resting the sides on pieces of wood, bricks or other stable supports - otherwise when you spread the screen filler with the squeegee it can touch the surface underneath. Spread the screen filler across the screen using the squeegee, trying to evenly coat the screen in 1 or 2 passes. If you go over the screen multiple times the drawing fluid may start to be washed away - don't worry if you miss some spots or it isn't perfect, you can always touch it up later by brush with more screen filler. Wipe off any excess screen filler from the edge of the screen and let dry completely (overnight is best). With cold water and a spray attachment if possible, rinse the drawing fluid out of the screen. It may take a while to completely rinse out and you may have to gently scrub it with your fingers or a nail brush to get it all off. Let dry completely. Place 1 or 2 pieces of cardstock or 1 piece of light cardboard inside each bag to prevent the ink from bleeding through to the other side. Make sure that the cardstock or cardboard covers the entire area to be printed and that the bag is even and smooth. With the screen lifted open (if you are using a screen with a hinge), position the tote bag under the screen such that the design will print as desired. If you are not using a screen with a hinge, you may wish to make tape markings where the screen should be aligned. You can use the screenprinting ink straight from the jar or you can mix your own colors - bear in mind that the ink will dry slightly darker, so you may want to test it on a swatch to make sure you like the final color. Spoon 2-3 spoonfuls of ink onto the base of the screen and gently spread it over the screen with the screen lifted to "flood" the screen with ink. If you are using a screen without a hinge, you will need to have a friend hold the screen in place while you do this step. Lower the screen and pull the squeegee back and forth at a 45 degree angle, pushing down to force the ink through the screen. The biggest problem I had with printing these bags was incomplete printing where I hadn't gotten enough ink through, so make sure you are thorough in this step - you may want to go back over areas of detail, such as the text, a few additional times. Practice and see what works well for you - this is why it is important to have a few extra bags, because it may take you a few tries to get the hang of it. Once you are done printing, again gently spread the ink over the screen to flood it - this prevents the ink on the screen from drying too quickly in between prints. Carefully lift the screen off the printed bag, and continue on to the next print. If you are stopping for more than a few seconds, or if you have printed 20-30 bags, you should stop and wash off the screen to make sure that ink doesn't dry on it and block it up (the screen will dry off relatively quickly if lightly patted dry with a towel and then left to dry completely). Lay the printed bags out to dry (a wooden clothes drying rack is handy for this) and remember to set the ink according to the manufacturers instructions (usually ironing on high for 3-5 minutes with a pressing cloth). Just stumbled upon this post--love it! Thanks! This is fabulous! I may try to do this for my wedding!